When I was pregnant with my first baby, I wanted a natural childbirth. I read the pregnancy and childbirth books that we’re given to me and that was about it. I had some tips in my head but for the most part, things were going to be a “grin and bear” it type labor. That method can work for some women but for the most part, if you want a natural labor you are going to need more than just a tough it out mentality. I can attest to that! My first labor was not so easy. I basically dealt with contractions by pushing through the pain and it didn’t get me very far. By the time I was dilated to 4cm I was begging for an epidural. I am glad to say that after that baby, I figured out a few techniques and tips for natural labor and I was able to have a natural labor with no issues. These tips make all the difference in my opinion. My last childbirth was a cake walk compared to my first labor. Sure it was hard but it really wasn’t that painful and I never even thought about any pain meds! 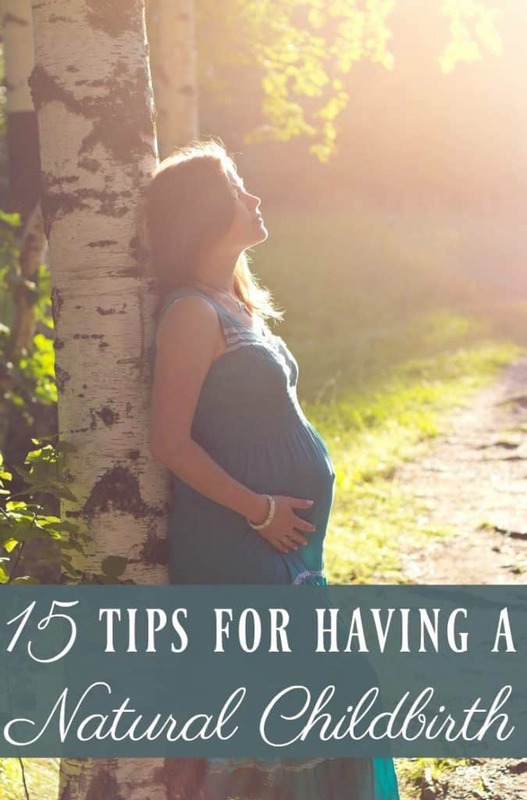 If you are wanting a natural labor (be that at home, birth center, or hospital) here are some tips that you might want to consider! Now it doesn’t matter if you are having a home birth or hospital birth, it doesn’t matter if you are going with an OB or a midwife… what you really need to consider is choosing a provider that will help you achieve your natural birth desires. Many providers will say they support your decision but what I’ve found that you really want is someone who will help you make that decision happen! It makes a world of difference to have someone help you push through things instead of someone who offers you an epidural when the going gets tough. I’ve talked about choosing a birth location before. It’s very personal and can be different for each woman. Some say that if you want a natural birth then you should choose a home birth but that’s not really the only option and definitely shouldn’t be an option you choose if you do not feel comfortable with it. I myself, have hospital births. Hospitals are probably as “un-natural” as you can get but it’s where I feel best at and I’ve found a great pro-natural hospital that helps me get the natural births that I want. Do your research and decide if you want to have your baby in a hospital, birth center, or at home. The second you are pregnant, you’ll hear the horror stories, you’ll see the reality shows… While yes, these may be true and obviously could happen to you, hearing and watching these horror stories only enhances the fear-tension-pain cycle. The more you are afraid of pain, the more painful things will be. It’s better to avoid all the horror stories completely (or at very least build up a wall so that those stories bounce off of you) and surround yourself with positive birth stories. I had never heard of red raspberry leaf tea until my third pregnancy but I wish I had known about it sooner! Red raspberry leaf tea helps tone the uterus so that once you start having contractions they are more effective and it can make labor shorter (particularly the second stage of labor). When you are pregnant with your first baby, you are clueless. You have no idea what stripping membranes means or what EFM stands for. So during those 9 months of pregnancy, fill your head with every single detail you can get your hands on. Read great natural pregnancy books, search pinterest for natural birth tips, read about positive natural births, talk to other natural mamas about their best advice for having a natural birth. Learn what common tests and procedures are done in pregnancy and labor. Steer your own pregnancy and don’t get bullied into things you do not want. Learn that you have the right to say no to absolutely any procedure (hospital policy or not). You want to learn about all the common things involved in pregnancy and childbirth so that you are informed enough to make a decision. As I mention in the beginning of this post, most women need an actual childbirth method. By 30 weeks you will need to decide which childbirth method is right for you. There are many methods out there: hypnosis for childbirth (commonly hypnobirthing or Hypnobabies), Lamaze, the Bradley Method, and more. Look into these birthing methods and see if they seem like a good fit for you. I often tell pregnant women that how you act and what you want when you are sick is likely how you’ll act and what you’ll want when in labor. For instance, I like to be left alone when sick. When I’m in labor I do best on my own; in my own world. My husband is great but if he was trying to help with the Bradley Method, I’ll probably hate him during labor. Thus I choose Hypnobabies which allows me to do my own thing. Now I’ll admit, I’m not a big exerciser. I have my moments but generally I am not a fan. When I’m pregnant, what little motivation to exercise that I had goes out the door with first trimester fatigue. That said, exercising can keep you in shape and help prepare you for labor. Exercise in general is great. Labor can be quite the event and having the stamina for it comes in handy. However, there are some specific exercises that are particularly great for childbirth such as squats. Everyone talks about doing kegels when you are pregnant but if you really want to strengthen that pelvic floor then squats are where it’s at! It is also good practice in case you end up using a squat position in labor or pushing. Even the great Ina May Gaskin has said “Squat 300 times a day and you are going to give birth quickly”… now 300 a day is probably asking too much but adding squats to your daily routine can definitely be a good thing! Sadly due to the lives we live, our babies aren’t always able to get into a good position by themselves. As I’m sure you are aware, babies can position themselves in any way they please while in the womb. However, as you get closer to delivery day, there are positions that are better than others. The main one being head down. While it’s entirely possible to deliver a breech baby (head up, feet down) it’s not ideal. Next, it’s best if baby is anterior (baby’s facing your back). A posterior baby (baby facing your front.. “sunny side up”) is not ideal and often leads to back labor. Babies positions are labeled by acronyms (LOA, ROA, ROP, OA, etc) I could go into all the positions but that’s another post so for now, I’ll direct you to Spinning Babies’ baby mapping post. If you’ve determined that baby is not in an ideal position, you can help baby turn with a variety of methods… again I direct you to Spinning Babies’ post on how to “spin” your baby. If you are having a home birth then this obviously doesn’t really apply to you as you will labor at home for the entire duration. However, for those using a birth center or hospital, it is best to labor at home for as long as you can. Once you step foot into the labor building, you can be put on a clock or pushed into procedures that you’d rather avoid. A common practice is to use the 4-1-1 rule to know when to go to the birth center/hospital. 4-1-1 is when you have contraction coming every 4 minutes, for about 1 minute each, lasting for at least 1 hour. By then you should be in good active labor and hopefully you won’t have much longer. Another train of thought is to leave home when you truly feel like you can’t take it any longer. This might be when you are actually in transition though so depending on how your labor goes, it could be cutting things close. Some people disagree with this. Many say that if you write a birth plan then things are sure to not go according to plan. Obviously that can be the case, a birth plan is not something to dictate how things will go no matter what, a birth plan is really just to inform the doctor/nurse/midwife of your plans so that they can be supportive. If things need to change then that is fine and you can face those changes as they come up. It was a lot easier for me to focus on contractions when I wasn’t stressed out about standing my ground. Think about what you do or do not want and write a birth plan at the very least it will help you decide on what you want. Labor is not the time to confine yourself to a bed. Yes, that’s what all those birth movies show us and what we are led to believe but trust me, if you are up and moving your labor will be faster and more likely to not need interventions. Moving helps the baby move down and get into a proper position as well. This is especially helpful if you have a posterior baby which can make labor much more difficult. There are many moves that can help turn a posterior baby which will then help labor go faster and easier. When I was in labor with my fourth, I got to the hospital and wanted to just stay still; I did not want to move. Thankfully, my husband told me that we were going to walk this baby out (and thankfully I didn’t want to hit him for that statement) so we walked around the hospital. It was hard work as I was already in active labor but I went from 4-10cm in just 4 short hours. So even if you really don’t want to, get up and move. Walk, dance, bounce on a ball… just do something. This ties into the child birth methods greatly but there’s more involved. When you are in labor, do whatever you need to do in order to relax and stay as calm as possible. When you tense up, your contractions can not work as effectively and then labor will be more painful and longer. If you relax and allow each contraction to work with your body then things are easier and faster. I experience this with my first labor (the “grin and bear” it labor), with each contraction I tensed up and each contraction grew more painful. With my fourth labor, I relaxed with each contraction and each contraction while not completely pain-free was relatively easy and stayed at about the same pain level. I’ve only labored in a tub once but it was incredibly helpful. I had back labor with that labor and being in the bath helped reduce my pain levels. Laboring in the bath can really can take the edge off of contractions. Just know that usually it’s best to wait until you are in active labor (4-6cm) before taking a bath as getting in too soon can actually stop contractions. Also know that if you are delivering in a hospital, they’ll likely make you get out of the tub when it’s time to push. A doula can be extremely helpful during labor. Even if you don’t hire an actual doula, having a good support person there can help you get that natural birth. A doula/support person can help you into different positions, offer advice, and help you stand your ground in case someone starts pushing pain relievers on you. They can also be the voice of reason when you stay you can’t do it any longer… they know that when you stay that you are likely in transition and you’re almost done. When you are in labor you usually forget that important fact. That oh so classic, laying down pushing position that we’ve all seen is the worst way to push a baby out. It’s used because it’s easier on doctors because they can see everything but it’s also the position that gives baby the narrowest exit route. In fact, some positions like squatting can gain you an extra 1-2 cm! That’s a big benefit when you are pushing a baby out. One of the best bits of advice I’ve heard is to push in whatever position is comfortable and often times that is whatever position you are in (or have been laboring in). Did my midwife like that position? No. In fact, she asked be to get on the bed and I outright told her no. She then went with what I wanted and poor lady delivered my baby in caul and had to break the water right on top of her shoes. However, that position was what I had been laboring in and what I was most comfortable in. It was definitely much easier to push in that position then in the laying down position!